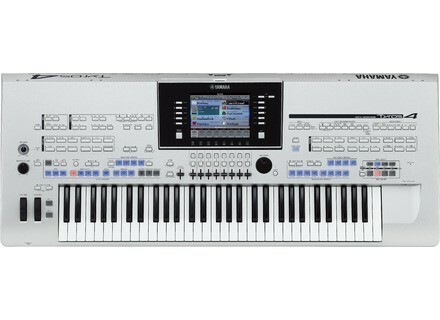 Tyros 4, Keyboard Arranger from Yamaha in the Tyros series. The Tyros4, shipping in October, 2010 offers built-in vocal Style and Voice content, created with advanced sampling techniques, and introduces control over gospel, pop and classical choirs – even doo-wop vocals. Additionally, the Super Articulation 2 Voice library has been upgraded to bring a new level of realism to non-keyboard instruments like strings, guitars, brass and woodwinds, the company says. All of the included Voice libraries, including Super Articulation 2 and Mega Voice-powered accompaniment Styles (interactive patterns that cover an immensely wide range of musical genres), deliver the sounds of top studio musicians to create a personal backing band that delivers uncanny realism. The expanded Super Articulation 2 Voices bring non-keyboard instruments to life with humanistic techniques and automatically switch to various attacks (note-on), main-bodies (sustain), and note releases (decay), based on how the player hits the keys, according to Yamaha. Playing a Saxophone Voice with smooth legato technique makes the passage sound like it is being delivered all in one breath by a horn player, for example, but playing staccato notes creates a sound where the notes seem like they are blown individually. Placing notes together – or spaced far apart – automatically determines how a note might bend up or down to arrive at the next note in a passage. This work is all done seamlessly inside the instrument and comes very naturally to any keyboardist, regardless of playing ability. This next-generation Tyros can reproduce instruments and arrangements from over 500 different styles of music from around the world with the press of a button – 50 more than Tyros 3, Yamaha assures. Studio-style DSP effects like reverb, chorus and EQ add an extra element of sound quality to the 2,153 dynamic instrument Voices, 30 organ flutes and 44 drum sets. Multi-pads allow for special phrases, and even trigger selected samples in sync with a particular style in real time. Visit www.yamaha.com for more details. Teenage Engineering OP-1 Goes Beta Teenage Engineering has announced that 90% percent of its OP-1 is completed and working, with the beta test phase about to start.